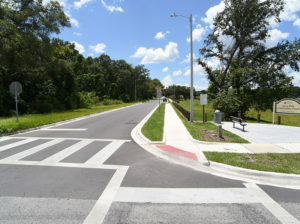 East Diana Street Extension from North 45th Street East to North 47th Street, Hillsborough County, Hillsborough County BOCC - Faller Davis & Associates, Inc. This project provides the local community with a safe, aesthetically appealing, and functional connection to the new Lucy Dell Community Pond Park, a focal point and asset to the area. The project involved the design of a 720′ roadway extension, along with sidewalk, on-street parking, and lighting. 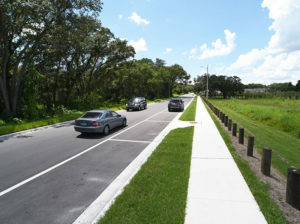 The typical section is a two-lane curb and gutter roadway with 8′ parallel parking and a 5′ sidewalk on the north side within the existing 55′ right-of-way.